The Budapest Cafe Orchestra; what an evening! The Budapest Café Orchestra that performed on Sunday evening in the Village Hall was astonishingly good. A huge thanks to Lympstone Entertainments for bringing such talent, humour and great music to us. Their extraordinary skills, great sense of humour and amazing variety of music kept the packed audience cheering, clapping and laughing out loud. 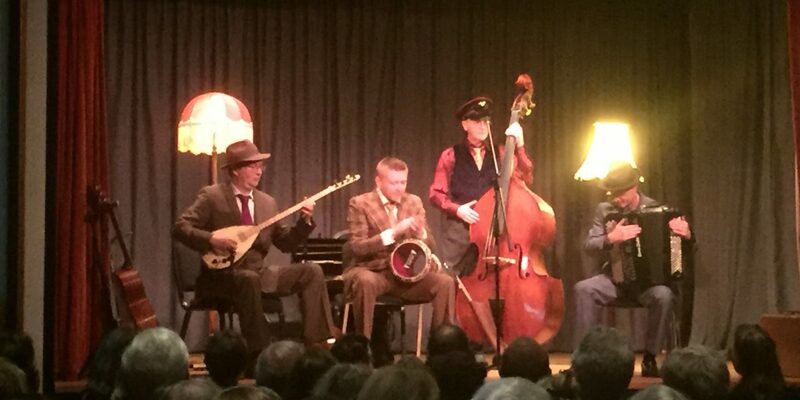 The ‘orchestra’s members were Chris Garrick (playing violin and doumbek: a type of drum), Kelly Cantlon (double bass), Adrian Zolotuhin (saz, guitar and balalaika) and Eddie Hession (button accordion). Their unique combination of classical, folk and jazz scores was a delight, you just never know what was coming next, such was their variety of pace and activity. Arrangements included themes from James Bond, the Archers, the Teddy Bear’s Picnic, The Onedin Line, Captain Pugwash, Born Free, Gershwin’s ‘Summertime’, ‘Poldark’ or ‘Apache’. Their real talent lay in making a surprise of the unsurprising, hilarity from the ordinary, and foot tapping fun all evening. Thanks again Lympstone Entertainments, please don’t leave it another five years before inviting these boys back!